After reading the first few chapters of an advance copy of The Complete Idiot’s Guide to Playing the Ukulele, I went out and bought my first ukulele. And I’m very glad because, by the time the book finally hit stores the first week of August I feel I can tell you I’m an honest to goodness ukulele player already. Just about everything I know about ukuleles I learned from this book. If you’ve been thinking about the ukulele as your next stringed instrument (or maybe your first), I strongly suggest you get this book first because you might never need another one. 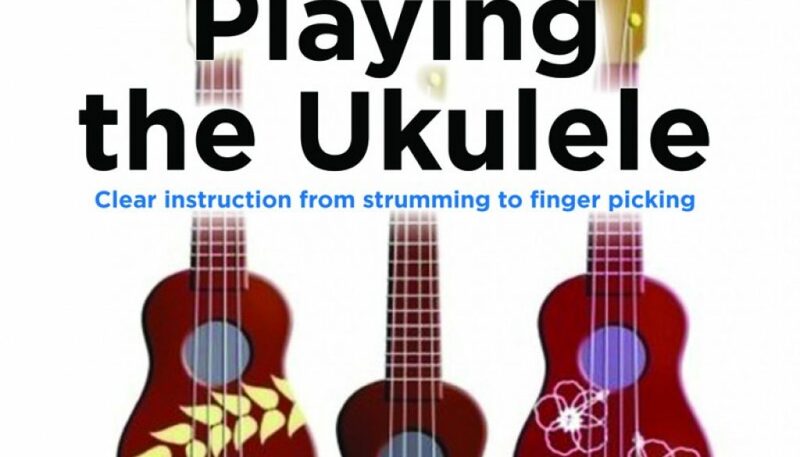 The Complete Idiot’s Guide to Playing Ukulele is David Hodge’s fifth book on how to play a musical instrument (see what else he has written here). The book’s tone is charged with the confidence of an accomplished musician and teacher, but someone who has the ability to bring a friendly sense of instruction to the written page. Mr. Hodge is a writer who teaches, as opposed to a teacher who also writes. As with any of the Idiot’s Guide how-to books, the author assumes you are totally new to the instrument. The embarrassment of visiting a music store knowing nothing about ukuleles can be avoided by reading the first chapter. The opening section treats us to a brief history of how the ukulele came to be, its basic anatomy, and the different sizes you should know about when visiting the store. If you’ve never played a stringed instrument before this is where you start to realize what an exciting adventure you’re about to begin. Guitar and bass players will also find the opening section rather interesting. A ukulele’s tuning is different to a guitar, but it is also very much the same in terms of the intervals of the notes of the strings. You’ll be going back to basics, where you have to relearn the location of notes on the smaller fretboard, but the chord shapes will be familiar to you, as well the many techniques you can use to play your ukulele. Even the more confident musicians will not want to skip this part as there’s a lot of helpful information on correct posture and how to hold the ukulele. This is followed by a series of warm up exercises that are perfect for getting used to reading ukulele tab and rhythm charts. Next it’s time to start learning some chords. We start off learning four of the easiest and most common ukulele chords. It’s a lot like guitar, in that if you know four chords you can play thousands of songs. This is the part where guitar players are most likely going to take a break from reading and start trying to play every single song they know on the ukulele. But you don’t just want to strum four chords all the time, do you? Probably not. So when you jump back in, you’ll find example songs that aren’t really about adding to your repertoire. They are a part of a series of smartly arranged lessons on strumming patterns and techniques that will help you sound more like a seasoned player. You’ll leave behind the simple up and down strumming and start playing like someone who really knows what they’re doing. People passing your practice space might even turn their heads to see where the George Formby sound is coming from. Take your time mastering the strumming and alternating string patterns in the next few chapters. After each new technique is added to your “˜gig bag’ the author suggests ways you can apply it to the earlier examples in the book. This will have you flipping back and forth until you know the page numbers by heart. When you turn the earlier, more rudimentary examples into more developed sounding pieces you’ll have an excellent measuring stick of how far you’ve made it to date. And you’ll be constantly improving your skills to create and arrange music. As you progress further into the book, you’ll discover the exciting possibilities of different fingerpicking styles and soloing techniques like slides and bends. Yes, you can do all that on a uke too! To be honest, this isn’t a book for idiot’s at all. No matter how little you know about the ukulele at first, by the time you finish everything, you’ll be the one answering peoples questions about ukulele. If you already play guitar, the ukulele is a nice diversion. Learning another instrument will spice up your guitar playing, not to mention make your guitar look and sound huge when you get back from the ukulele. I’ve been traveling with my new ukulele quite a bit. It’s small enough to take places I’d never think to bring a guitar. It’s a great attention getter and conversation starter. It seems that a lot of people are interested in ukuleles these days and will stop to talk about it. Why not find out for yourself? Get this book first, and then get ready to strum and pick all day long. The Complete Idiot’s Guide to Playing the Ukulele is available now, in stores and online at Amazon and iTunes. Downloadable extras are available on on the Idiot’s Guide website. What tuning are the lessons – Baritone or other? I have a baritone uke, so prefer to have material presented in that format, though it is possible to transpose. Even if you mainly play just one instrument, its always nice to have multiple instruments around. I think all musicians should be able to play multiple instruments and a ukulele is nice to learn. I have about 8 different instruments in my home and its always nice to add a little something etra to your songs. Thanks for the post!